We love art. We love golf. And if we can get ourselves to Atlanta some time between February 5 and June 24, we’ll be able to see the exhibit The Art of Golf at the High Museum of Art. Regrettably, I don’t think this is going to happen. But I can dream. And look at the exhibition website. Formed in 1867, the St Andrews Ladies Club grew to include 500 members within twenty years—a total close to that of the exclusively male Royal and Ancient Golf Club of St Andrew’s membership of 795. Strict conventions governing acceptable dress meant that women were obliged to play in the restrictive, tightly laced, full-length clothes then deemed fashionable and appropriate. More practical golfing attire became popular at the turn of the century. Hendrick Avercamp’s winter scene conveys a message about democratic social values: various classes – rich and poor, old and young, male and female – are bound together through leisure. Nevertheless, kolf was connected to elite status in seventeenth-century Dutch society, here evidenced by the players’ colorful, elegant clothing. The copper support, unusual for Avercamp, provides a smooth surface appropriate to the gemlike quality of the depiction. Two thin tree trunks enclosed in the ice provide the goal for the group of four kolfers in the right foreground. You know, I’m pretty sure I saw this painting at a show in the National Gallery in Washington, D.C., not that long ago. Yes, I must have. 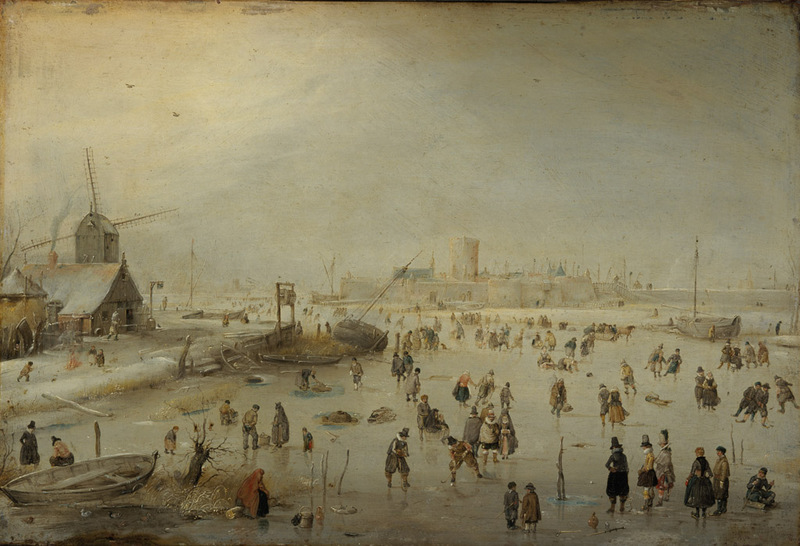 I just found this post that I wrote in May 2010 about a visit to the National Gallery, and in it I briefly mention what I describe as an “intimate” temporary exhibition, Hendrick Avercamp: The Little Ice Age. The painting was surely there. I wonder if we can squeeze in an Atlanta trip.